Tube Mill, Tubes Mills, Steel Tube Mill, Steel Tubes Mill, SS Tube Mill, SS Tubes Mills, Stainless Steel Tube Machine Manufacturers, Steel tube mill manufacturer ,Buy steel tube mills, SS Tube mill machine, Tube mill machinery exporter, tube mill manufacturer, Steel Tube Mill, High Speed Carbon Steel Tube Mills, Carbon Steel Tube Mill Projects, Stainless Steel Tube Mill Projects, Carbon Steel Pipe Mill Projects, Buy Tube Mill Online, Above given is the important keywords by K.S. 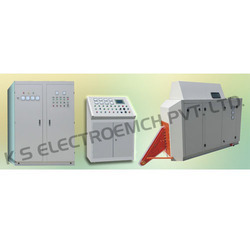 Electromech Private limited company. K.S. Electromech Private limited company deals with all the above keywords and Rolling mill related products. K S ELECTROMECH offers Single/Triple tube Hydrotesters equipped with oil/water high pressure (up to 5000 psi) intensifiers, automatic handling systems and chart type pressure recorders according to API/ASTM/BS standards.Features:1) OD Sealing Type2) Oil & Water Intensifier.3) Continuous Chart Type Pressure Recorders & SG Transducers for each Tube results4) Closed Circuit Blocking Heads for automatic Balancing of end thrust.5) Quick Change Toolings.6) Computerized Data Acquisition System. We are offering High Speed Tube Mill Equipment. 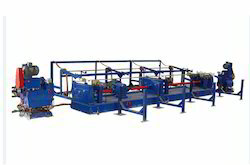 Fully automatic line stating from un - coiler to cut off carriage manufactured with high quality steel and machine to strict accuracy of the components. Raw material should be of weld - able grade hot rolled, cold rolled steel stripes & stainless steel strips. Tool rolls are manufactured by high grade die tool steel high carbon high chromium duly machined hardened & grinned.If you are interested and want to buy the product click below. Looking for Tube Mill And Pipe Mill ?